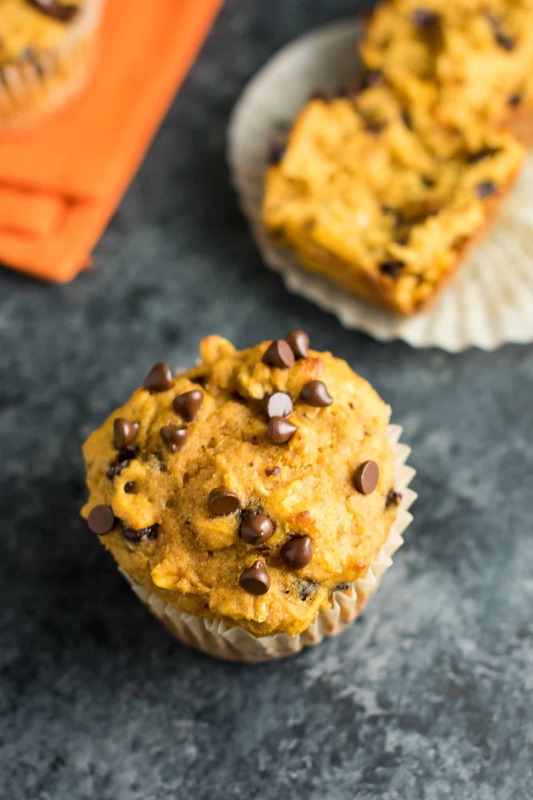 Today might be blazing hot and humid, but I’m ringing in the nearing fall season with these healthy pumpkin chocolate chip muffins! I don’t know about you, but fall is my absolute favorite season. Gimme all the pumpkin bread, apple crisp, pumpkin dip, cozy clothes, and mornings in the 60’s. If only it could be fall year round, now that would be my dream! Fall also means we are edging closer to Christmastime, which is basically the greatest time of the year. I just adore the fall and winter and all the cozy family time vibes! I for one am convinced that it’s never too early for pumpkin. August is over which means that ALL THE PUMPKIN things start in September. Don’t be judging me for all the pumpkin that’s about to be happening in my kitchen. 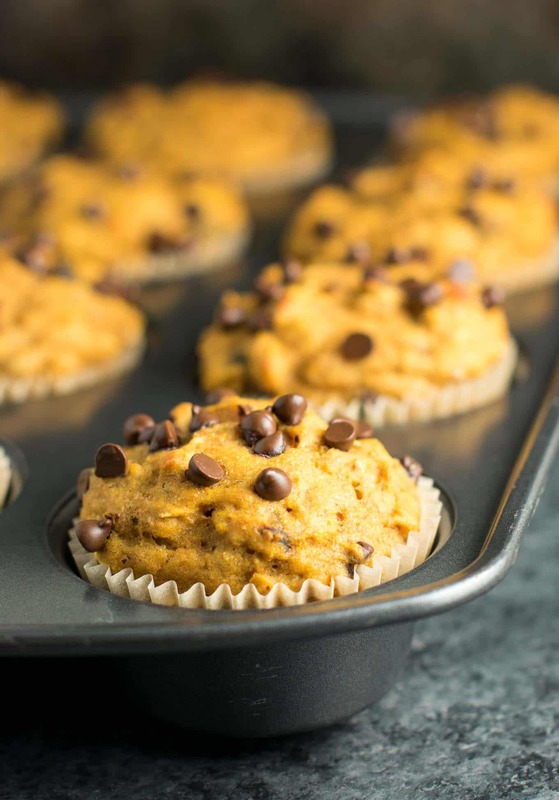 I’m dreaming of cool fall days and these pumpkin muffins for breakfast! I’m so excited that my favorite season is just around the corner! Whisk together nonfat yogurt, pumpkin, eggs, brown sugar, and vanilla extract until combined. In a separate bowl, whisk together your dry ingredients. Fold in chocolate chips and stir. Line 12 muffin cups with parchment paper muffin liners. Sprinkle on additional more mini chocolate chips over the tops! Bake at 400 degrees for 15-17 minutes, or until a toothpick inserted comes out clean. 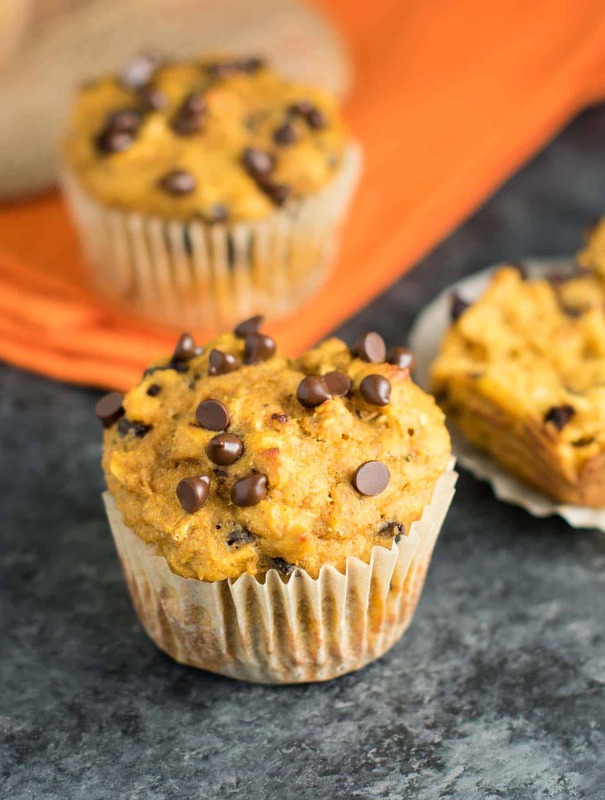 These pumpkin chocolate chip muffins are healthy enough to eat for breakfast, but also double as a guiltless treat for your sweet tooth. The key to these fluffy moist muffins is greek yogurt. 1) helloooo it’s healthy, no fat, sugar free, and low calorie! It also means that we don’t need any oil in this recipe! 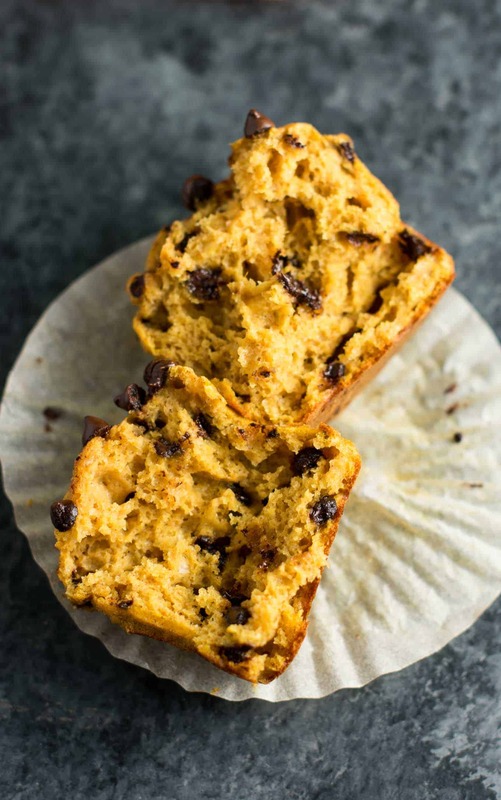 The combination of pumpkin puree + greek yogurt gives these muffins a great texture without the need for any oil! Because these muffins do not have oil, you might have trouble with them sticking to the muffin liners. The easy solution for this is to buy parchment paper muffin liners at your grocery store. Parchment liners have changed my life! The muffins literally do not stick at all and come right out without a problem. We are also using whole wheat flour in this recipe, but you would never know these muffins are healthy! My aim is to always make eating healthy taste delicious. Life is too short to eat bad tasting food! One bite and I knew I had found a new favorite fall breakfast! 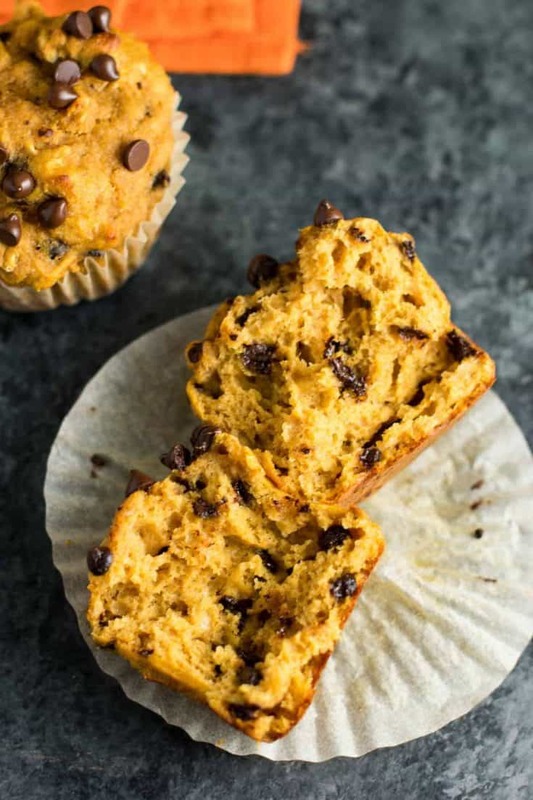 These muffins are low in sugar, making them perfect for a healthier (and protein packed) breakfast or snack. These would also be great to curb a sweet tooth for dessert! I always crave something sweet at night, and these are a much healthier choice than an ice cream cone for sure. I used mini chocolate chips for cuteness factor, but you can use normal sized as well! Are you ready for fall? I know I am! 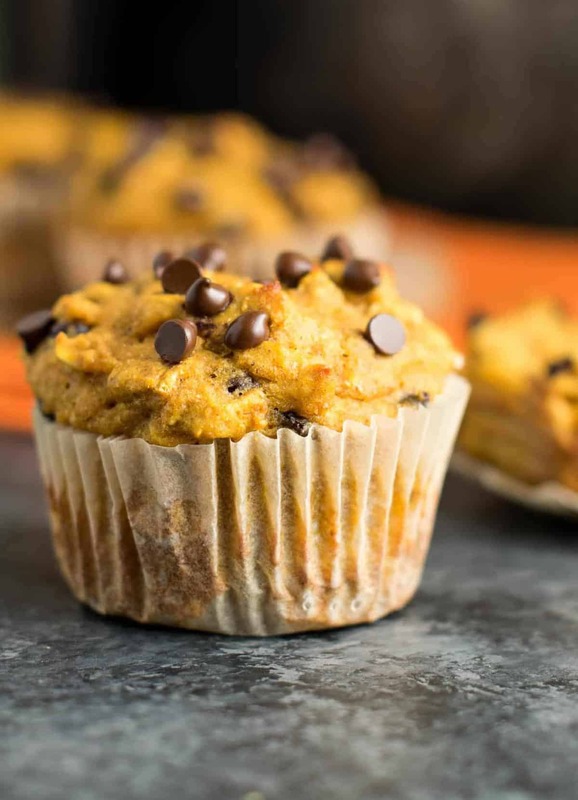 Looking for more healthy pumpkin recipes for fall? Here are some reader favorites! Saving this recipe for later? Click HERE to pin this recipe! 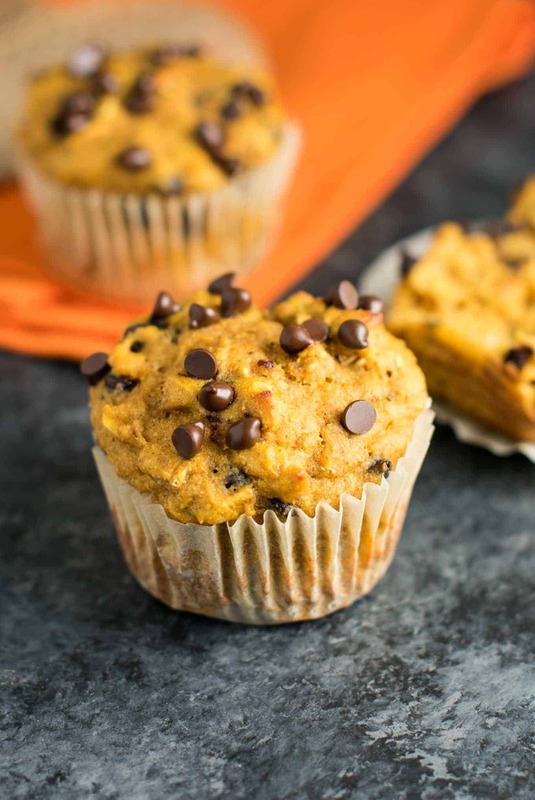 Healthy Pumpkin Chocolate Chip Muffins made with whole wheat flour and greek yogurt. 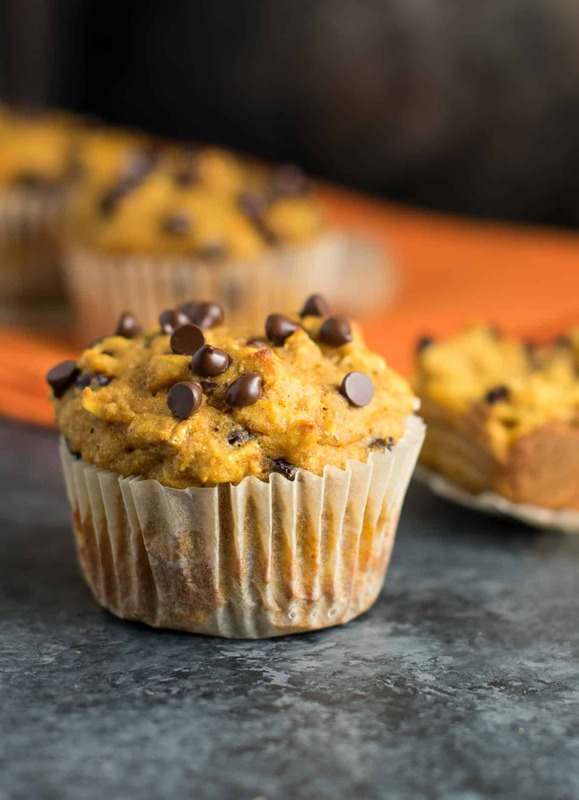 A healthy fall treat with no oil and lighter ingredients! GIMME ALL THE PUMPKIN THINGS. Or just these muffins. Lots and lots of these muffins. They look oh so good! I am making these as we speak! I can’t wait to try! Can you make them with almond flour and coconut sugar instead? I have not tried it using almond flour so I cannot guarantee results. However, I do think that you can easily substitute the coconut sugar! Do you use semi sweet chocolate chips or regular milk chocolate? I used semi sweet chocolate chips! Can I make these in mini muffin trays? If so, how long would I bake them? Thanks! I’ve never tested in mini muffin tins but you could try! Just try halving the bake time then go up from there. You should be able to tell when they’re done by inserting a toothpick and it comes out clean. Hi Laurie, I do not provide nutritional information for my recipes, as it will vary based on the specific brands you buy as well as the substitutions that you make. You can use a calculator like this one: http://www.myfitnesspal.com/recipe/calculator if you want the exact calories. Hope that helps!